In deep 10-inch skillet, cook chopped bacon over medium heat until crisp. Remove to paper towel-lined plate; discard drippings. In large bowl, stir together half of the bacon, the chicken, enchilada sauce, 1 cup of the cheese, and 1 tablespoon ranch dressing & seasoning mix. In same skillet, heat vegetable oil until hot. Cook onion and a pinch of salt in oil until soft and translucent, about 5 minutes. Add chiles; cook until any liquid is mostly evaporated. Quickly stir in flour, making sure of no dry lumps. Cook 1 minute; add 2 tablespoons ranch dressing & seasoning mix. Slowly beat in chicken broth with whisk. Simmer about 8 minutes or until slightly thickened. Beat in sour cream; simmer 1 to 2 minutes. Spread some of the sauce in ungreased 13x9-inch (3-quart) glass baking dish, just to coat bottom. Fill tortillas with chicken mixture, rolling up to make enchiladas. 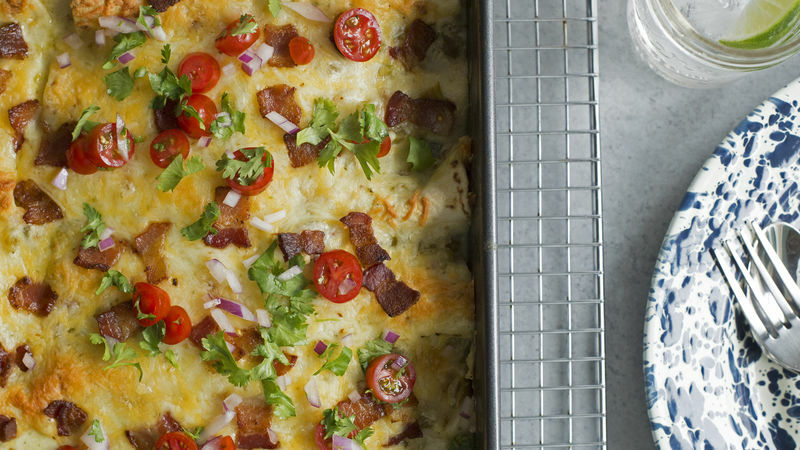 Arrange enchiladas in baking dish in two rows of six; top with rest of sauce, remaining cheese and bacon. Bake about 30 minutes or until edges of enchiladas begin to brown and sauce is bubbling. Let stand 10 minutes before serving with whatever toppings you like. These freeze great! Either make an entire batch to freeze, or split the batch into two pans -- cook one tonight, and stash the other in the freezer for another day. I like to use disposable aluminum baking pans for freezing, so my go-to baking dishes aren't relegated to the freezer for an extended period. Cool the enchiladas in the pan (unbaked) and wrap well in heavy-duty foil, label and freeze. The enchiladas will keep up to 2 months in the freezer. When ready to bake, defrost in the refrigerator overnight, then add 10 to 15 minutes to bake time. You can use more traditional corn tortillas for this recipe. Since they are generally smaller, you may need more than 12 tortillas. Red enchilada sauce in the filling is equally delicious in this dish! Use whatever color sauce you prefer. Since the ranch seasoning has plenty of salt, we recommend using a reduced sodium chicken broth so the final dish doesn’t end up too salty.